Does your child enjoy eating peas? Do you want to teach him about the different types of peas found across the world? Are you considering coloring pages as a means to teach your kid about peas? Well, then our post would be perfect for you. Peas grow on climbing plants that produce pods containing seeds. They are one of the favorite veggies of children. The sweet vegetable goes over without a hitch. If your child enjoys peas, then he will love our peas coloring sheet as well. 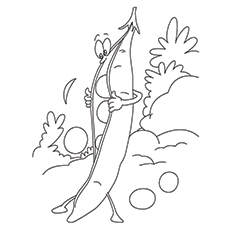 Here are ten peas coloring pages that will make him adore this vegetable even more. 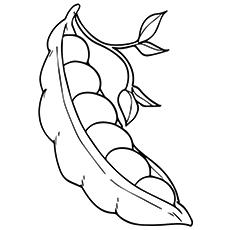 Here is a simple pea coloring page of a pod. 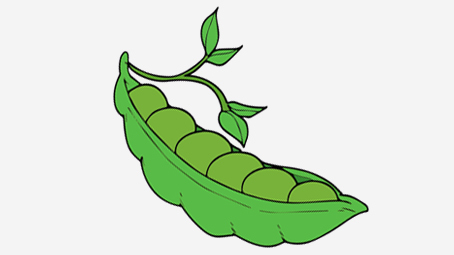 A pea pod is about 5 to 8 cm long and 1 cm wide. It is bright green with a small point at an end. The peas or seeds lie inside the pod arranged in a row. Each of the peas is attached to a seam of the pod. Here is a coloring image of sugar snap peas. Sugar snap peas have crisp, tender, small and pale green edible pod with juicy seeds. These peas are around 5 to 8 cm long. The seeds of the sugar snap peas are rounder than the snow peas. 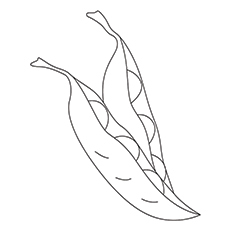 Early perfect is a crescent shaped pea pod that grows an average of 3 inches in length. Each pod contains 8 to 9 medium-sized tender peas. The peas are sweet and drought resistant. Most of the veggies are low in protein, but early perfection peas have enough supplies of the nutrient; another reason to add peas to your child’s diet. The little princess is facing a difficult time sleeping because of a tiny pea in the bedding. The coloring page is from the Danish fairy tale “Princess and the Pea”. In the story, a young girl arrives at a prince’s house claiming to be a princess. 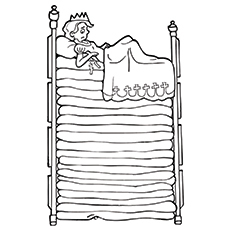 The prince’s mother tests the royalty of the girl by placing a pea in her bed. 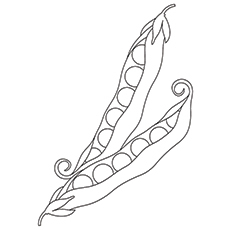 The coloring sheet features Garden peas. Garden peas are the most common type of peas. The pods of the Garden peas are inedible. So you must remove it before eating. Garden Sweet is one of the most favored varieties of peas. The variety of pea is extra sweet and tastes amazing. 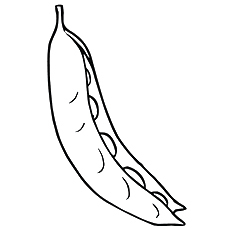 Its pod is 3 ½ inches long, and each pod contains nine to ten peas. The garden sweet peas get ready in 75 days. Did you know that peas have a high sugar content but start losing their sweetness soon after the harvest! The peas you see here are snow peas. Snow peas are flat-podded peas that are around 8 to 10 cm long. They have around 2.5 cm tender and sweet seeds. Both the pods and seeds of snow peas are edible. 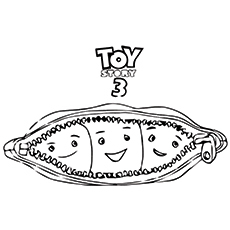 The cute pea pod-coloring page you see here is a toy owned by Bonnie in the film “Toy Story”. The names of the three peas are Peanelope, Peatey, and Peatrice. The toy appears with the rest of Bonnie’s toys while playing a board game. The strange looking peas you see here belong to the famous game Plants V/s Zombies. It is the third plant obtained in the Wild West. It is a shooting plant. The number of peas the pod shoots at time matches with the amounts of the head it has at that time. 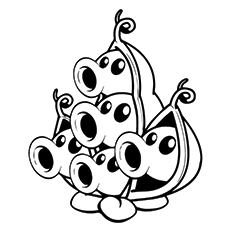 Players can increase the number of heads by planting another pea pod on top of it. 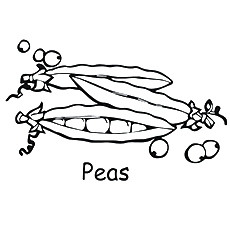 Here is an amusing peas coloring page. 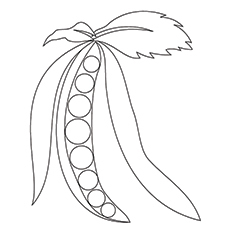 The coloring sheet shows a pea pod examining its seeds. We feel that it’s checking if the seeds have ripened or not. What does your child think about it? Tell him to write a short narrative to go with the diagram. We hope your child enjoys reading about different varieties of peas while coloring the pages. We would even suggest you to plant peas in your garden. It will be a fun activity to do during the weekend. And do not forget to share your experience with us.